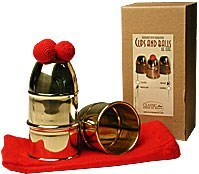 The perfect set of cups for the effect, Bazar de Magia's Cups and Balls set is hand-spun from brass and designed with a larger load capacity than most. As such, each cup measures 3.25-inches (8.3cm) tall and 2.75-inches (7cm) in diameter at the mouth. Also available in copper and aluminium versions.